The one “who operated a Hong Sin Seo for 10 years”, who shudders at the monthly rent, Na Baek Su, dives a 1 million dollar project, The Search for a Princess!! For money she’ll do anything!! she who says that money, money and more money is the best, Suh Jan Di. 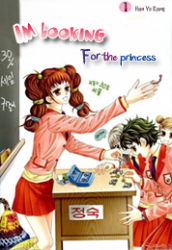 To help her uncle, Na Baek Su, she joined the Search for a Princess… Her princess candidates list shows a couple of people… Cold, charismatic, the one who’ll go down in the history of the fashion world, Yu Jin. The one who’d even sell the Sameun group for the money crazed girl, Eun hyuk. A wingless angel’s infinite love, our eternal goddess, fashion model Eh Eun. A love story that outrageously intertwines the princess candidates and Suh Jan Di, with lots of trouble and excitement!